Our folding security gates offer extra layers of defense and safety for workers and visitors. Our security gates can be installed in less than 30 minutes (click here to see our installation video). Our commercial gates will provide years of performance and service. Each folding security gate is made of heavy-gauge galvanized steel and is a perfect solution for warehouse dock doors with limited space and to manage your environment by protecting sensitive and secure areas from theft, pilfering, and trespassing. Folding security gates allow fresh air to enter the building, creating a more comfortable work environment. Gates, when folded, tuck neatly against the wall. Loading docks, warehouses, shipping and receiving doors, personnel entrances, retail stores, storefront glass windows, pawn shops, jewelry stores, shopping centers, hospitals, malls and more. Folding security gates provides a quick & easy way to control unwanted traffic, inventory theft, improve efficiency, prevent damage to equipment and separate work environments. If you can not find what you’re looking for we can custom make security gates to secure your specific area. 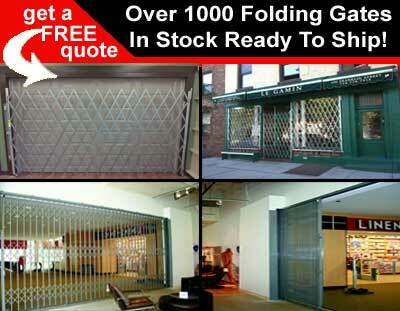 Call one of our security gate experts for a FREE QUOTE.